Objectives Dementia with Lewy bodies (DLB) accounts for 10%–15% of dementia cases at autopsy and has distinct clinical features associated with earlier institutionalisation and a higher level of carer distress than are seen in Alzheimer's disease (AD). At present, there is on-going debate as to whether DLB is associated with a more rapid cognitive decline than AD. An understanding of the rate of decline of cognitive and non-cognitive symptoms in DLB may help patients and carers to plan for the future. Design In this cohort study, the authors compared 100 AD and 58 DLB subjects at baseline and at 12-month follow-up on cognitive and neuropsychiatric measures. Setting Patients were recruited from 40 European centres. Participants Subjects with mild–moderate dementia. Diagnosis of DLB or AD required agreement between consensus panel clinical diagnosis and visual rating of 123I-FP-CIT (dopamine transporter) single photon emission computed tomography neuroimaging. Outcome measures The Cambridge Cognitive Examination including Mini-Mental State Examination and Neuropsychiatric Inventory (NPI). Results The AD and DLB groups did not differ at baseline in terms of age, gender, Clinical Dementia Rating score and use of cholinesterase inhibitors or memantine. NPI and NPI carer distress scores were statistically significantly higher for DLB subjects at baseline and at follow-up, and there were no differences between AD and DLB in cognitive scores at baseline or at follow-up. There was no significant difference in rate of progression of any of the variables analysed. Conclusions DLB subjects had more neuropsychiatric features at baseline and at follow-up than AD, but the authors did not find any statistically significant difference in rate of progression between the mild–moderate AD and DLB groups on cognitive or neuropsychiatric measures over a 12-month follow-up period. Dementia with Lewy bodies (DLB) has distinct neuropsychiatric features. At present, we do not know whether the poorer prognosis of DLB is due to a more rapid cognitive decline compared with Alzheimer's disease (AD). In this fairly large cohort of patients with DLB and AD, while there was no difference in level of cognitive impairment (Cambridge Cognitive Examination (CAMCOG) score) at baseline and at 12-month follow-up, DLB patients had significantly higher Neuropsychiatric Inventory (NPI) and NPI carer distress scores both at baseline and at 12-month follow-up. Therefore, the worse prognosis of DLB is likely to be mediated by neuropsychiatric or other symptoms and not only by cognitive decline. Inclusion of high number of subjects from 40 European clinical centres. Well-characterised cases with both consensus panel clinical diagnosis (three clinical experts) and dopaminergic transporter single photon emission computed tomography imaging. No autopsy data were available and therefore it is possible that more rapid cognitive decline may be present in pure DLB. Only 1 year of follow-up. There was higher attrition rate (no-follow-up assessment) in the DLB group, and DLB patients that did not return for follow-up were more impaired than AD patients. Awareness of the rate of cognitive decline and also of non-cognitive symptoms can help carers and patients to adjust and plan appropriate lifestyle changes and to make arrangements for the future. This frequently involves making difficult decisions regarding treatment of psychiatric and motor symptoms and utilisation of limited resources available for patients with dementia. Since its recognition as a neurodegenerative disorder, a body of research has focused on the differentiation of DLB from other dementias, in particular Alzheimer's disease (AD), in terms of both cross-sectional and longitudinal clinical factors. In addition to the clinical syndrome described in the consensus diagnostic criteria, DLB is associated with higher levels of behavioural disturbance and care giver distress, lower quality of life and greater demand on resources when compared with AD.3 4 Despite these findings, there is uncertainty within the literature regarding progression and survival in DLB compared with AD. Studies have shown survival in DLB to be either comparable to5 or shorter6 than in AD. No differences in decline on global measures (eg, Clinical Dementia Rating (CDR)) have been reported.7 Studies of the progression of cognitive impairment have generally reported a similar7 8 or steeper5 rate of decline in DLB when compared with AD. An exception to this was a study by Stavitsky et al9 where AD patients had a steeper decline on cognitive and behavioural measures, although DLB patients had been more impaired at baseline. The development of 123I-FP-CIT single photon emission computed tomography (SPECT) now allows visualisation of striatal dopamine transporter, and consequentially dopaminergic degeneration in vivo, and differentiates between AD and DLB with a sensitivity and specificity of 78%–88% and 94%–100%, respectively.14 An abnormal visual rating on 123I-FP-CIT SPECT was incorporated into the most recent revision of the consensus diagnostic criteria.2 In the present study, our aim was to compare decline in cognitive, behavioural and global measures over a 12-month period in a prospectively followed cohort of subjects with either AD or DLB confirmed by consensus panel clinical diagnosis and normal (for AD) and abnormal (for DLB) 123I-FP-CIT SPECT imaging. The study was done in accordance with the current revision of the Declaration of Helsinki and the Good Clinical Practice: Consolidated Guideline approved by the International Conference on Harmonisation and applicable to national and local laws and regulations. At every participating site, the study protocol and all amendments were approved by an institutional review board or independent ethics committee. All patients and care givers gave written informed consent. Following inclusion in the initial study, participants were invited for clinical and neuropsychological re-assessment at 12 months. Clinical diagnosis at baseline, as previously reported, was established by an independent consensus panel of three specialist clinicians, who were provided with a patient profile compiled from quality-assured clinical data from the on-site investigators' case record forms and copies of on-site original source data.15 The same panel reconvened to consider the baseline and the 12-month follow-up data to arrive at a second and final consensus diagnosis. This final consensus diagnosis was used to derive the cohort for the present study. The following were undertaken at baseline and follow-up: MMSE, Unified Parkinson's Disease Rating Scale III (motor section),21 modified Hoehn and Yahr staging,22 clinical assessment of cognitive fluctuation scale,23 the Cambridge Cognitive Examination—revised version (CAMCOG-R),24 Neuropsychiatric Inventory with care giver input (NPI-D),25 visual object and space perception (VOSP) battery26 and CDR.27 The Cornell Scale for Depression in Dementia28 and the investigator's estimation of the patient's IQ level were completed at baseline but not at follow-up. Results of MRI and CT scans and the on-site investigators' clinical diagnosis before imaging were also available. The consensus panel did not have access at any stage to 123I-FP-CIT SPECT findings and was unaware of the patients' identities and the names of the centres and the investigators. Before any cases were diagnosed, the consensus panel was asked to diagnose 10 patients (separate to the study) for whom autopsy diagnosis was independently available. There was 100% concordance between the diagnoses made by the panel and at autopsy.15 Individual panel members reviewed each study case, including the baseline consensus panel diagnosis and all subsequent information, before meeting to agree a final clinical diagnosis of probable DLB, possible DLB or non-DLB dementia. Patients in the non-DLB category were further allocated to probable or possible AD, probable or possible vascular dementia or other. Within a few weeks of the baseline clinical diagnosis, SPECT images were acquired on a 2 or 3 headed γ camera (SPECT system) 3–6 h after a single intravenous injection of 111-185 MBq of 123I-FP-CIT29 (DaTSCAN, the radiotracer was supplied by GE Healthcare Buchler GmbH & Co. KG, Munich, Germany). See McKeith et al15 for details. Subjects underwent standard thyroid blocking. SPECT imaging was not repeated at follow-up. As previously described, three nuclear medicine physicians assessed scans, blind to diagnosis, using a 4-point scale (0, normal uptake; 1, unilateral putamen loss; 2, bilateral putamen loss and 3, virtually absent uptake)15; we used only the dichotomous division of normal (0) versus abnormal (1–3) images for analysis. For the present study, we combined the three independent reads and recorded the result of the scan as normal or abnormal if there was agreement between two or more raters. For the purposes of the present study, we included only patients with complete data sets from both baseline (T1) and 1-year follow-up (T2) assessments and with reliable images from the baseline 123I-FP-CIT SPECT session (n=225). These patients were divided into two diagnostic groups (AD and DLB). 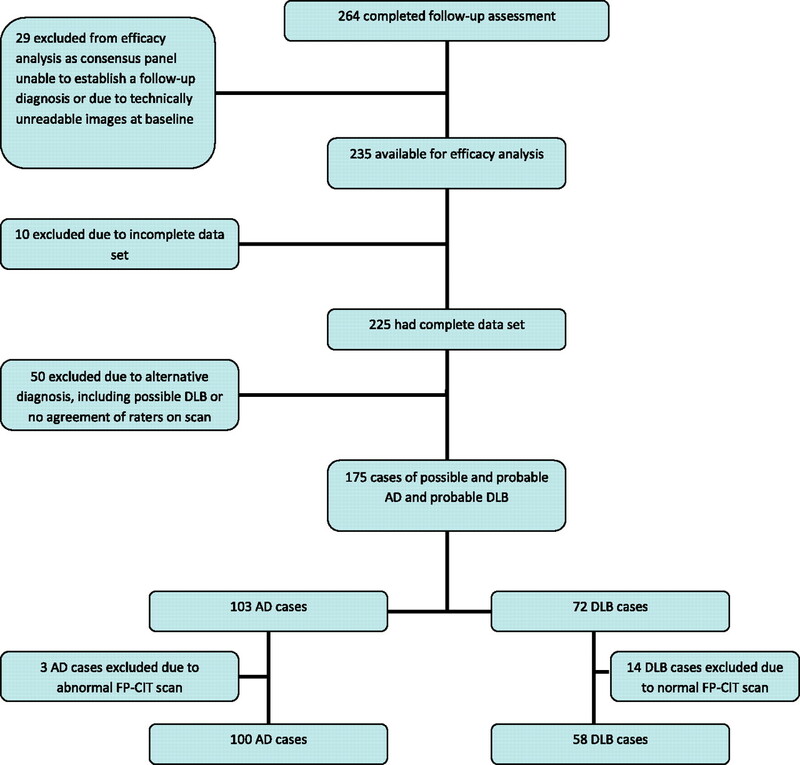 Inclusion criteria for the AD group were a consensus diagnosis of possible or probable AD at 12-month follow-up in addition to a negative (normal) 123I-FP-CIT SPECT read (n=100). To be included in the DLB group, patients were required to have a consensus diagnosis of probable DLB at 12-month follow-up and to have a positive (abnormal) 123I-FP-CIT SPECT image read (n=58). Patients with a dementia diagnosis other than possible or probable AD or probable DLB were excluded (n=50), see flowchart in figure 1. Flowchart of subjects included in the study. The flowchart details patients who completed both baseline and follow-up assessments. Twenty-five patients with a diagnosis of dementia with Lewy bodies (DLB) at baseline and 19 patients with a diagnosis of Alzheimer's disease (AD) at baseline did not return for follow-up and are therefore not included in the flowchart. Data were analysed using SPSS V.18. We compared baseline and 12-month follow-up data and change over time for the AD and DLB groups. χ2 tests were used to assess differences between the diagnostic groups (AD and DLB) with respect to gender and medication use at baseline. For normally distributed variables, t tests were used for between-group comparisons of baseline and follow-up variables. Mann–Whitney U tests were used for non-normally distributed baseline and follow-up data. Repeated measures analysis of variance was used for analysis of group × time interactions (comparison of change in variables over time in each group). General Linear Models with fixed effect were used to adjust for the difference in NPI scores and the scores on the Cornell Scale for Depression in Dementia at baseline. Baseline and follow-up data for the DLB and AD groups are presented in table 1. The groups did not differ in terms of age or gender. There were no between-group baseline differences in terms of CDR or use of cholinesterase inhibitors or memantine. The DLB group had a statistically significantly higher mean depression score at baseline and higher scores on the NPI, NPI carer distress and clinical assessment of cognitive fluctuation scales at both baseline and 12-month follow-up (p<0.001). There were no differences between the groups on cognitive scores at either baseline or follow-up. No significant differences in change in scores between baseline and 12-month follow-up for any of the variables analysed were identified. Results of analysis did not change when data were stratified according to gender. There was also no statistically significant difference between DLB and AD in the change of CAMCOG score after adjustment for scores on NPI and Cornell Scale for Depression scores. There were numerically greater changes (more decline) between baseline and follow-up on cognition, fluctuation and on measures of neuropsychiatric symptoms in the DLB patients but this did not reach statistical significance. The lack of a significant difference on the cognitive performance between the DLB and AD groups is unlikely to be due to lack of power, therefore type II error, as the effect size of that difference was very small (0.02–0.07) and only a sample size of 1685 subjects would have shown a significant difference. A higher number of DLB patients (25) compared with AD patients (19) did not return for a follow-up visit. DLB patients lost to follow-up were significantly more cognitively impaired than AD patients lost to follow-up at baseline on MMSE (score 17.3 vs 22.2), CAMCOG (score 53.1 vs 66.7) and executive function (score 8.4 vs 13.3). Since these patients lost to follow-up were not given a final diagnosis, they were not included in the main analysis. In a prospectively followed sample of patients with clinical consensus panel and dopamine transporter SPECT confirmed diagnosis of AD or DLB, cross-sectional assessments identified expected between-group similarities and differences in cognitive scores and clinical scales in addition to a higher level of carer distress relating to the symptoms of DLB patients. We identified no differences in rate of progression of cognitive or neuropsychiatric variables over a 12-month follow-up period. Our inclusion of only patients whose consensus clinical diagnosis was in keeping with neuroimaging results make it likely that diagnostic accuracy was very high. Severity of neuropsychiatric symptomatology, and hallucinations in particular, has also been associated with steeper decline in cognitive scores and increased risk of mortality and institutionalisation in AD, independent of antipsychotic drug use.35 36 These studies have lacked autopsy confirmation of diagnosis, and it is possible that the AD groups included individuals with undiagnosed DLB, who are more likely to experience hallucinations. We are not aware of any published data related to the impact of neuropsychiatric symptom severity on illness progression and survival in DLB. We did not identify any between-group differences in change over time of any of the variables examined, that is, NPI, fluctuations and cognitive performance. It is possible that the lack of detectable difference in decline of NPI and fluctuation scores over time is related to the already high scores at baseline in DLB. The majority of studies of the rate of cognitive decline in DLB versus AD have also reported no differences, for example,7 8 although the earliest reports were of more rapid decline in cognition in DLB,37 as were more recent studies.5 Several studies have reported relatively preserved cognitive scores, particularly in recall, before death in DLB compared with AD.5 As mentioned in ‘Results’, patients diagnosed as having DLB at baseline who were lost to follow-up were significantly more cognitively impaired than patients diagnosed as having AD at baseline who were lost to follow-up. These patients were not included in the final analysis, as the cohort analysed was derived from the final consensus diagnosis made at follow-up. Thus, although patients lost to follow-up appeared to differ cognitively depending on diagnosis and this could have affected the study's results, their diagnoses were not made at the same time point as for the patients included in the final cohort. Reviewing the characteristics of patients lost to follow-up must therefore be done tentatively, as their diagnoses were subject to change. While ours and the majority of studies do not support the idea of a more rapid decline in cognition in DLB, the available literature is split more evenly between findings of either similar or shorter survival in DLB compared with AD. One possibility is that reports of worse outcomes in DLB are related to increased frequency of antipsychotic use as a result of greater severity of neuropsychiatric symptoms. While more DLB than AD participants were prescribed neuroleptics in the present study, no differences in rate of progression were identified. Previous studies of cognitive decline in AD and DLB that have presented data on neuroleptic prescribing did not report any differences between the groups in use of these medications.8 39 In terms of survival, both early40 and more recent6 8 studies have reported shorter survival in DLB versus AD, despite likely changes in neuroleptic prescribing over this time as a result of better understanding of the potentially harmful effects in both DLB 2 10 and dementia as a whole. It therefore seems unlikely that reported differences in survival between DLB and AD could be entirely accounted for by antipsychotic use. The literature surrounding the differences in longitudinal outcomes in DLB and AD is therefore not easy to interpret. Overall, studies report outcomes in DLB that are either no different from or worse than in AD. Some of the difficulties involved in interpreting and comparing these findings are the differences in study design, use of clinical rather than pathological diagnosis, differing pathological definitions and retrospective analysis of clinical data. In addition, studies often rely on relative's reports on the onset of dementia, or use as baseline the time of referral, diagnosis or entry into the study. None of these methods necessarily identify equivalent disease stages and these difficulties highlight the complexity of the task of comparing the rate of decline between two disorders with different clinical phenotypes. In DLB, episodic memory is relatively spared in the early stages, but the presence of attentional and visuospatial impairments, visual hallucinations or movement disorder might be more disabling. Comparisons between AD and DLB are therefore not straightforward, and it is hard to define what is an ‘equivalent’ disease stage. The picture is further complicated by the frequent overlap of AD and DLB neuropathology and the insidious onset of both of these conditions. Our study would have been improved by a longer duration of follow-up and a more detailed breakdown of cognitive, behavioural and clinical measures. Furthermore, patients' ability to carry out ADLs was not measured, and this can be a useful marker of disease severity and progression. Exclusion of individuals with severe dementia and higher attrition (not returning for follow-up visit) of DLB cases with more severe cognitive impairment precluded detection of differences in progression that are present only in later disease stages. Larger cohorts of patients who could be stratified by stages of severity of dementia are needed to examine this possibility. The DLB group had a higher mean depression score at baseline and more patients took a neuroleptic. Both neuroleptics and antidepressants have been shown to have detrimental effect on patients with dementia and could lead to faster progression but this did not seem to be the case over the duration of 1 year. Without autopsy diagnosis, we were not able to differentiate patients with pure and combined pathology. In conclusion, on global cognitive measures, we did not find any difference in rate of progression between the mild–moderate AD and DLB groups over a 1-year period of observation. Cognitive decline is only one aspect of dementia and other impairments may in fact be more important and disabling.
. Validity of current clinical criteria for Alzheimer's disease, vascular dementia and dementia with Lewy bodies. Br J Psychiatry 1999;174:45–50.
. Patients with dementia with Lewy bodies have more impaired quality of life than patients with Alzheimer disease. Alzheimer Dis Assoc Disord 2007;21:150–4.
. Patients with Lewy body dementia use more resources than those with Alzheimer's disease. Int J Geriatr Psychiatry 2007;22:713–19.
. Relative preservation of MMSE scores in autopsy-proven dementia with Lewy bodies. Neurology 2009;73:1127–33.
. Survival and mortality differences between dementia with Lewy bodies vs Alzheimer disease. Neurology 2006;67:1935–41.
. Verbal and visuospatial deficits in dementia with Lewy bodies. Neurology 2005;65:1232–8.
. Differences in clinical course between dementia with Lewy bodies and Alzheimer's disease. Eur J Neurol 2009;16:212–17.
. The progression of cognition, psychiatric symptoms, and functional abilities in dementia with Lewy bodies and Alzheimer disease. Arch Neurol 2006;63:1450–6.
. Consensus guidelines for the clinical and pathologic diagnosis of dementia with Lewy bodies (DLB): report of the consortium on DLB international workshop. Neurology 1996;47:1113–24.
. Research evaluation and prospective diagnosis of dementia with Lewy bodies. Arch Neurol 2002;59:43–6.
. Dopamine transporter loss visualized with FP-CIT SPECT in the differential diagnosis of dementia with Lewy bodies. Arch Neurol 2004;61:919–25.
. Relative frequencies of Alzheimer disease, Lewy body, vascular and frontotemporal dementia, and hippocampal sclerosis in the State of Florida Brain Bank. Alzheimer Dis Assoc Disord 2002;16:203–12.
. Dementia with Lewy bodies: a comparison of clinical diagnosis, FP-CIT SPECT imaging and autopsy. J Neurol Neurosurg Psychiatry 2007;78:1176–81.
. Sensitivity and specificity of dopamine transporter imaging with 123I-FP-CIT SPECT in dementia with Lewy bodies: a phase III, multicentre study. Lancet Neurol 2007;6:305–13.
. Diagnostic accuracy of 123I-FP-CIT SPECT in possible dementia with Lewy bodies. Br J Psychiatry 2009;194:34–9.
. Dopamine transporter imaging with [(123)I]FP-CIT SPECT: potential effects of drugs. Eur J Nucl Med Mol Imaging 2008;35:424–38.
. Unified Parkinson's disease rating Scale. In: Fahn S, Marsden DC, Goldstein M, et al., eds. Recent Developments in Parkinson's Disease. McMillan 1987:153–63.
. Parkinsonism: onset, progression, and mortality. 1967 Neurology 1998;50:318.
. The clinician assessment of fluctuation and the one day fluctuation assessment scale. Two methods to assess fluctuating confusion in dementia. Br J Psychiatry 2000;177:252–6.
. CAMCOG–a concise neuropsychological test to assist dementia diagnosis: socio-demographic determinants in an elderly population sample. Br J Clin Psychol 1995;34:529–41.
. A new test of object decision: 2D silhouettes featuring a minimal view. Cortex 1991;27:370–83.
. A new clinical scale for the staging of dementia. Br J Psychiatry 1982;140:566–72.
. Cornell scale for depression in dementia. Biol Psychiatry 1988;23:271–84.
. One-day protocol for imaging of the nigrostriatal dopaminergic pathway in Parkinson's disease by [123I]FPCIT SPECT. J Nucl Med 1999;40:753–61.
. Clinical findings, functional abilities and caregiver distress in the early stage of dementia with Lewy bodies (DLB) and Alzheimer's disease (AD). Arch Gerontol Geriatr 2009;49:e101–4.
. Neuropsychiatric symptoms underlying caregiver stress and insight in Alzheimer's Disease. Dement Geriatr Cogn Disord 2010;30:57–63.
. Stress and burden among caregivers of patients with Lewy body dementia. Gerontologist 2011;51:76–85.
. Predictors of nursing home admission for persons with dementia. Med Care 2009;47:191–8.
. Risk of nursing home placement in dementia with Lewy bodies and Alzheimer's dementia. Ref Type: Abstract. Alzheimer's Demen 2010;5(Suppl 4):79.
. Hallucinations, cognitive decline, and death in Alzheimer's disease. Neuroepidemiology 2006;26:68–75.
. Delusions and hallucinations are associated with worse outcome in Alzheimer disease. Arch Neurol 2005;62:1601–8.
. Cognitive decline is faster in Lewy body variant than in Alzheimer's disease. Neurology 1998;51:351–7.
. More severe functional impairment in dementia with Lewy bodies than Alzheimer disease is related to extrapyramidal motor dysfunction. Am J Geriatr Psychiatry 2006;14:582–8.
. Alzheimer's disease and its Lewy body variant: a clinical analysis of postmortem verified cases. Am J Psychiatry 1996;153:1269–73.
. Psychiatric morbidity in dementia with Lewy bodies: a prospective clinical and neuropathological comparative study with Alzheimer's disease. Am J Psychiatry 1999;156:1039–45. Author disclosure statements At the time of the study, ZW, JOB, IM, KT, JB and JD have received consultancy payments from GE Healthcare. JR has received funding for neuroimaging research from GE Healthcare. TQ has no disclosures. Contributors ZW: involved in conception and design of the study as well as being a member of the consensus panel, contributed to statistical analysis and interpretation, co-wrote initial draft of the manuscript and prepared the final version of the manuscript; IM: involved in conception and design of the study as well as being a member of the consensus panel, contributed to and approved the final version of the manuscript; JR: involved in conception and design of the study, contributed to data analysis and interpretation, co-wrote initial and subsequent drafts of the manuscript, contributed to and approved the final version of the manuscript; TQ: involved in conception and design of the study, data processing, analysis and interpretation, contributed to and approved the final version of the manuscript; KT: involved in conception and design of the study, performed the visual analysis of the SPECT data, contributed to and approved the final version of the manuscript; JB: involved in conception and design of the study, performed the visual analysis of the SPECT data, contributed to and approved the final version of the manuscript; JD: involved in conception and design of the study, performed the visual analysis of the SPECT data, contributed to and approved the final version of the manuscript; JOB: involved in conception and design of the study as well as being a member of the consensus panel, contributed to and approved the final version of the manuscript. Funding The data collection was sponsored by GE Healthcare who made data available for further analysis for the present study. Ethics approval Ethical approval in 20 countries obtained (various). Data sharing statement The data used in this study were supplied by, and remain the property of, GE Healthcare. Hence, these are not available for sharing.